Extra large neoclassical floral garden bench. Perfect for a garden or patio. Extra long for plenty of seating. Ornate scroll work with flowers. Lightweight for easy moving. This bench has an elaborate grapevine design with large grape leaves and fruit clusters. It also has a curved seat and back with six splayed legs. There are many coats of white paint on this bench. It could use a good sandblasting and repaint. Best to be placed on the lawn as opposed to concrete. Better grip on the ground. Vintage Hand Painted Piano Bench. 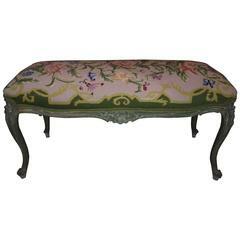 Gorgeous floral hand painted top and feminine cabriolet legs. Perfect for at the foot of a bed or piano. Sheet music or magazine storage inside. Neoclassic style wrought iron bench with distressed paint finish. Stylized after Francois Carre with sunburst seats, vertical concave steel slat backs and wrought iron legs and curled arms.